Posted: February 3, 2012 in The Daily Grind, Where Have I Been? A couple of weeks ago, I went on a solo trip to Baguio City. It was the first time that I travelled to an unfamiliar place alone and it was refreshing – I would love to do it again in the future. I would just like to share with you my thoughts which I scribbled on a napkin while having my lunch at a quaint cafe in the chilly city. Many people are afraid to be alone. But not me. I love solidarity. I love the peace it usually brings. I am not afraid to be left alone with my thoughts. Being alone means you can be yourself. You could order anything you want from a menu and not worry about how it would keep up to everyone’s differing tastes and expectations. Anyway, EVERYONE is only YOU. You could eat as little (without the risk of appearing too prissy or timid or anything) or as much (without people judging how much of a pig you are) as you want. Being alone brings a new sense of courage. Be not afraid of your decisions because you are not deciding for anyone else but you. You can take the risks, get lost in the crowd, or take the wrong turn. No one else will scold and scoff at you for the wrong decisions. 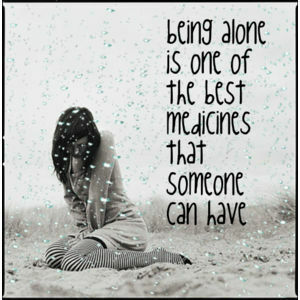 When you are alone, take time to evaluate how you feel about it. Because really, if you cannot be alone with yourself for a little while, how else could you expect someone else to be with you for the rest of their lives?